Congress and its chief Rahul Gandhi have repeatedly accused PM Modi of "robbing" the nation and benefiting the big fish. 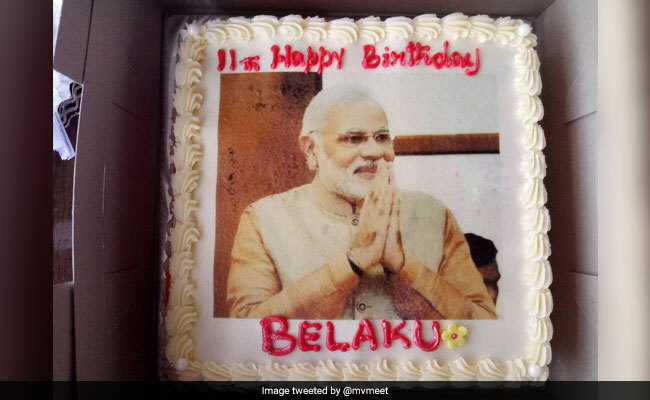 A little girl named Belaku wanted PM Modi's photo on her birthday cake. Prime Minister Narendra Modi today tweeted his blessings to a young girl, Belaku, who, according to her father, wanted his image on her birthday cake. A tweet with a photo of the birthday cake along with a message caught the Prime Minister's attention on social media. The man who posted it is Mahesh Vikram Hegde, the co-founder of Postcard News, arrested earlier this year on charges of spreading fake news. He tweeted: "Today is my daughter Belaku's birthday. I asked her 'What do you want on your birthday?' She said 'I want Modi Ji's photo on my birthday cake' Indeed, PM Modi is a Chor... A Chor who has stolen even kid's heart (sic)." PM Modi, in reply, wrote: "Please convey my blessings to young Belaku. I pray for her happiness and good health." The impact of the exchange was that Belaku received greetings from complete strangers. Some said "Belaku" means "light" in Kannada. @mvmeet Belaku Means light. Such a wonderful name. You are so lucky to have Modiji blessings Belaku. Happy birthday to you. God bless you with good health and happiness. The "Chor (thief)" reference has been bandied about in the row over the Rafale jet fighter deal with France; in the acrid back-and-forth ahead of several state elections and the national polls next year, the Congress and its chief Rahul Gandhi have repeatedly accused PM Modi of "robbing" the nation and benefiting the big fish. The ruling BJP has emphatically denied any wrongdoing.